Super Typhoon Haiyan, locally known as Yolanda is the strongest typhoon recorded in modern history. Packing up winds of 320km/h with maximum wind gusts of up to 380km/h and having a forward velocity of 29km/h. 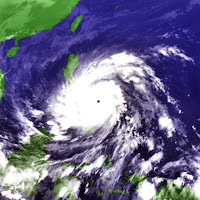 That is the maximum state of the typhoon before it had its first ever landfall at Guiuan, Samar at exactly 5:00 AM local time (21:00 UTC) at dawn of November 8, 2013, Friday. From then, it has directed a straight swath of havoc from Eastern to Central and Western Visayas of the Philippines. The tragedy then has called for a collective effort of people with various expertise to assist on the post-disaster missions. This includes the need for an accurate map so as to distinguish areas of concern so that rescuers, and field workers may be able to do their job in clearing and rescue operations over the distraught islands that were a direct hit of the record-breaking typhoon. Maps have always been a handy tool which has multitudes of use. And for this recent disaster that hit the country, this is used by disaster mitigation teams to assess the damages brought by the typhoon, prepare the needed materials for rescue and food supply, ascertain the vital locations for refugees, and a guide for the field operatives to go about their rescue and humanitarian missions. As this article is written, only a few of the disaster areas are being covered by the media due to the remoteness of the location, add to it the damage brought by the typhoon to communication and power lines. And those locations that were able to report the situation already has horrendous information that is being brought to the public. These include towns and municipalities to which 90-95% of the infrastructure has been damaged including death toll that reaches thousands. Tacloban City, the capital city of the island of Leyte is even reporting 10,000 casualties. This was brought about by ferocious winds and storm surge that reached as high as 2-storey buildings. 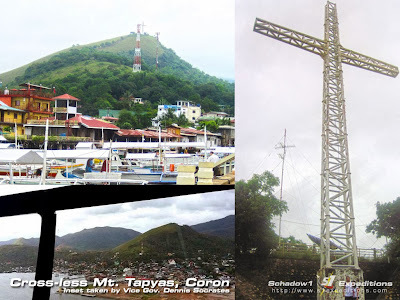 The Calamian Group of Islands at the Eastern Philippines (famously known as Coron, Palawan) has not been spared and its 700-step Mt. Tapyas view deck was not spared and the cross on-top of it was destroyed. The photo below was from our mapping expedition at Coron last July 2012 comparing it from the latest photo taken by Vice Governor Dennis Socrates showing that the cross is no longer there after typhoon Yolanda's onslaught. Other informational links for Geo-spatial mapping and rescue reference. 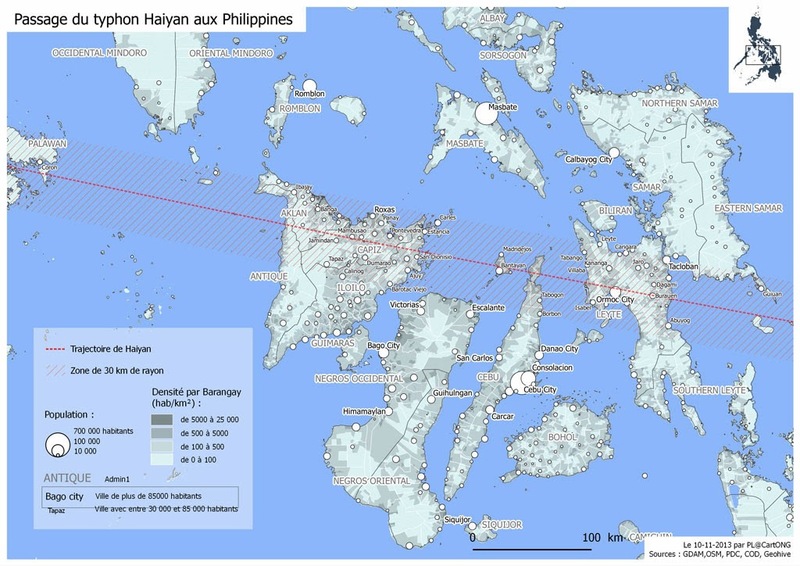 Haiyan Crowdmap - a collection of photos taken from various disaster-stricken towns and is geo-tagged on Openstreetmap. 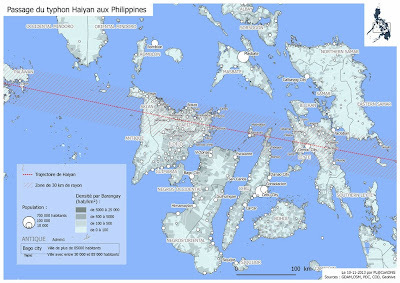 Copernicus Emergency Management System for Haiyan - a collection of latest satellite imagery of affected towns after the onslaught of Haiyan. Taken by the Copernicus programme of the European Commission in collaboration with European Space Agency. Digital Globe First Look - a set of initial and latest high-resolution satellite imagery of the disaster-stricken areas of Yolanda right after the typhoon has passed available for trace mapping. Taken by the Digital Globe satellite. 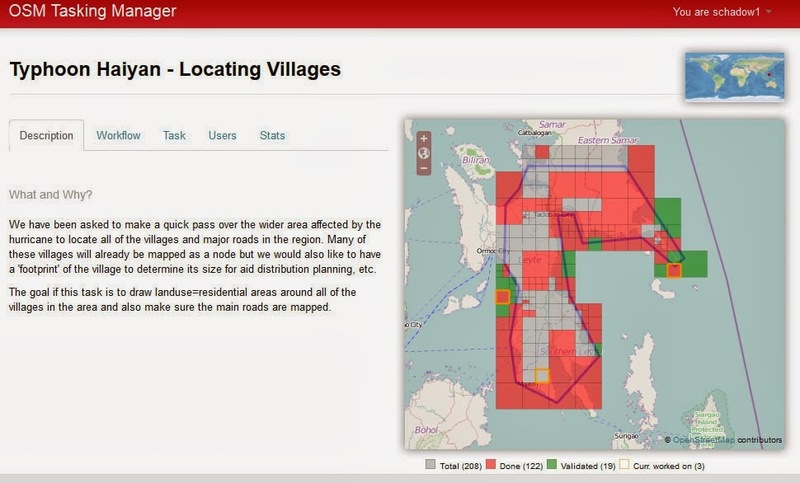 The Department of Social Welfare and Development of the Philippine government has been collating the disaster map using a basemap from Openstreetmap data which can be used by the government and non-government organizations in planning and mobilizing the rescue efforts. See DSWD Disaster Mitigation and Response Situation Map. Mapping advocates all over the world has been called and to which have responded to the need of the country. As of the time this article was written, several Openstreetmap mapping tasks has been opened to which more mapping advocates in the Philippines as well as the whole world are continuously being called to provide assistance. 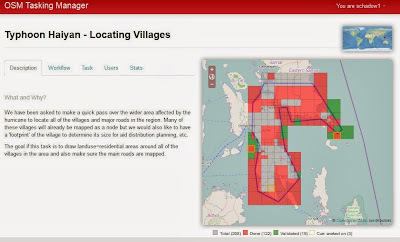 The following are the Openstreetmap humanitarian mapping tasks that are opened to mapping advocates for them to freely pick up an area tile to map extensively. The list will grow and will be updated as soon as mapping tasks are opened to other towns devastated by the same typhoon. Task 340 - Detailed Infrastructure map-up of Basey and Guiuan, Samar, Ormoc and other town strip on the same longitude, and Bantayan Islands/Northern tip of Cebu. Task 356 - Roxas City using 11/11 satellite imagery taken on post-Yolanda, tag destroyed buildings. 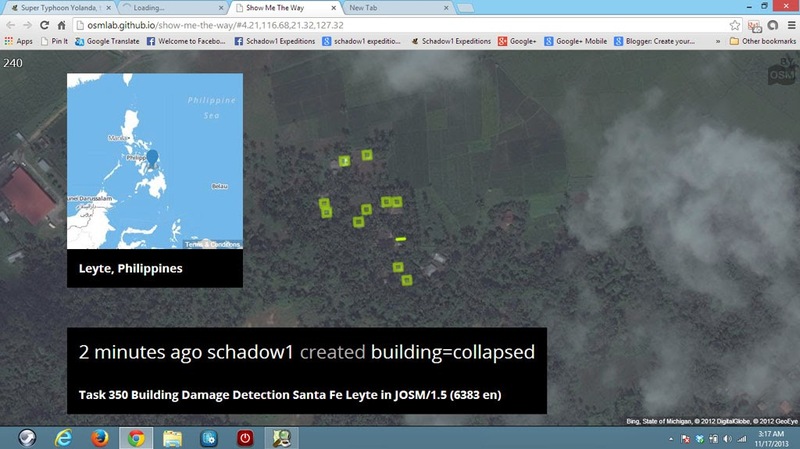 Task 360 - Northern Cebu using 11/13 satellite imagery taken on post-Yolanda, tag destroyed buildings. 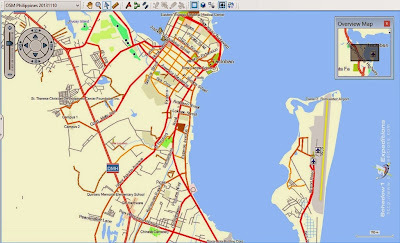 A screenshot of a map editor (for Openstreetmap) while working on Task 350 using latest satellite imagery. 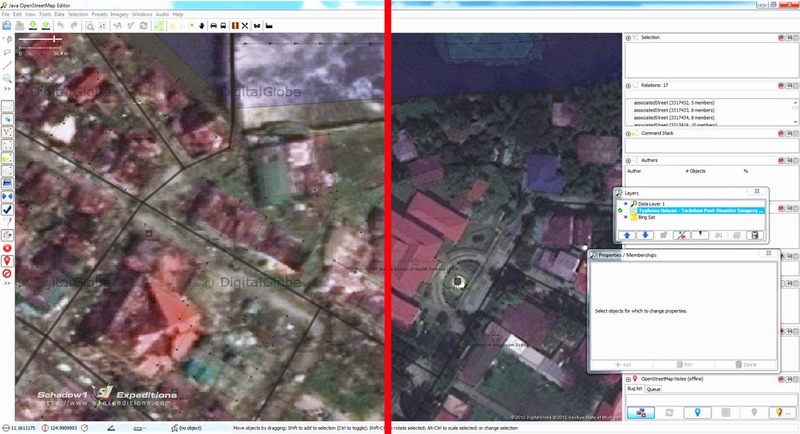 The image above is a screenshot of a map editor (for Openstreetmap) while we are working on Task 350 - Assessment of Destoyed Structures on Yolanda-stricken areas. The image shows a part of Palo, Leyte to which after finishing the area above Palo's town center, we were saddened as out of 3464 buildings and homes, 125 were partially damaged and the rest were completely destroyed. And in case you want to report a missing person or found a person safe, Google has an available Person Finder for the Yolanda Disaster. To date, we would like to thank all the mapping advocates and rescue volunteers in assuring that we have an accurate map of the disaster stricken areas. 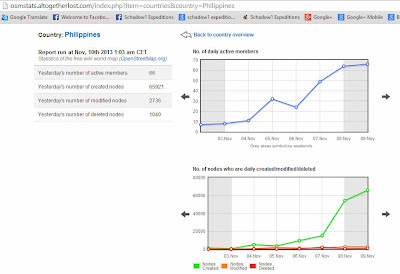 Initially, there was a 20,000 node increase by 66 mapping advocates worldwide after the typhoon has devastated Visayas; and is continuously increasing over the hour. 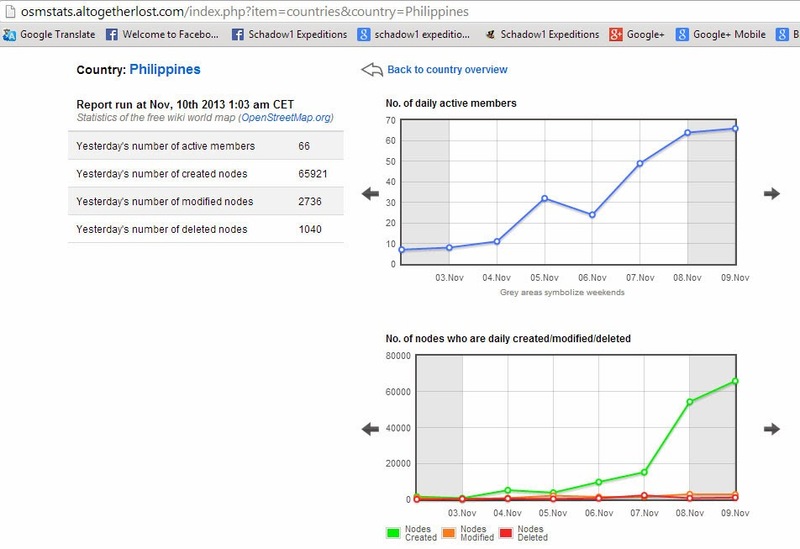 The activity of the mapping advocates for the Yolanda crisis can be seen here in realtime. As of 2013-11-11, 649,656 map updates from 343 mapping advocates worldwide. As of 2013-11-13, 1 million map updates from 484 mapping advocates worldwide has been reached. As of 2013-11-16, 2 million map updates from 908 mapping advocates after 2 weeks since the disaster. In response to the various map-ups initiated by various mapping advocates for the country due to the Yolanda crisis, Schadow1 Expeditions will be providing daily updates (from the regular semi-weekly updates) of our Garmin GPS routable map based on Openstreetmap Philippines data until needed. This will update the routable map simultaneously as advocates continue to map-up the disaster-stricken areas. The map can be used with their GPS device to provide them guidance without the need for an internet connection as they go about the mobilization of their relief efforts. Repacking of goods at the same location indicated above. Contact +63 2 8512681 for scheduling. Another way to help you if you have your own vehicle or if you just like to freely accompany the survivors to their destination. Nothing is free in Manila and it is hard to find a free ride. 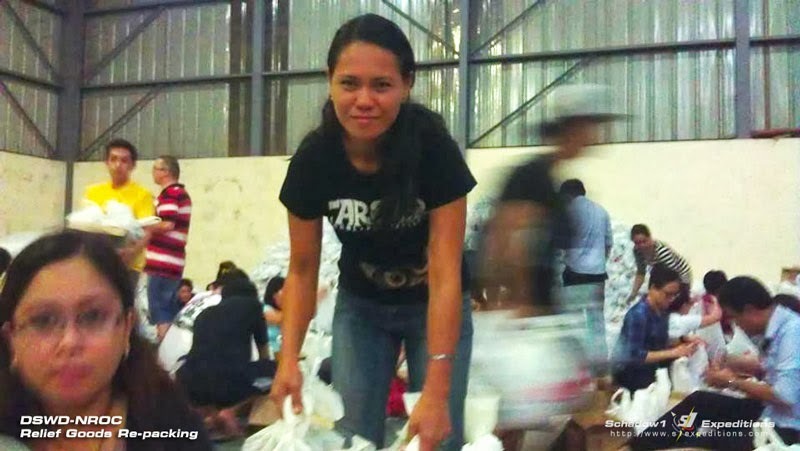 Most of those who are in exodus from different parts of Samar and Leyte have nothing to bring except their selves and the cloth they wear without any money. Help transport them from Villamor Airbase to their relatives. Some of them were just chance passengers and were not able to contact their relatives upon their arrival. First flight arrives at about 9AM and arrives at an interval of 2 hours from then until 10PM. Go to DSWD Desk at the Grandstand of Villamor Airbase and inform them that you'd like to volunteer in driving or accompanying the survivors to their relatives. 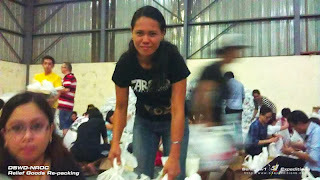 #reliefPH - everything concerning about relief operations.